Every autumn, trees and shrubs take on their brilliant display of reds, oranges, purples, and yellows that mark the end of the growing season. Fall foliage may make for ideal photo backdrops and scenic days in the countryside, but closer to home leaves may be more of a hindrance than an aesthetic pleasure. The hundreds of leaves that adorn the maples, oaks and other trees near homes will eventually fall as autumn turns into winter. Some will float down to lawns, while others will get lodged in gutters and downspouts, posing problems that can cause substantial and potentially costly problems for homeowners. Homeowners know that gutter cleaning is an important part of fall home maintenance, but they may not completely understand why. Gutter cleaning can be a messy and time-consuming project, making it a project many homeowners are apt to put off. Waiting to clean gutters can lead to considerable problems, so it’s best to tackle the job well in advance of the winter. Gutters guide rainwater and runoff from the roof so it drains properly away from homes. When gutters are clogged with leaves, a number of problems can occur. · Leaks: Water will take the path of least resistance. When clogged gutters do not allow the water to drain away properly, water will find other ways to the ground. It may work itself right into the walls and ceilings of the home. In addition to damaging walls and ceilings, moisture inside the home can promote mold growth. It also makes interior spaces more appealing to pests. · Excess weight: Gutters are meant to hold the weight of traveling water and not much more. 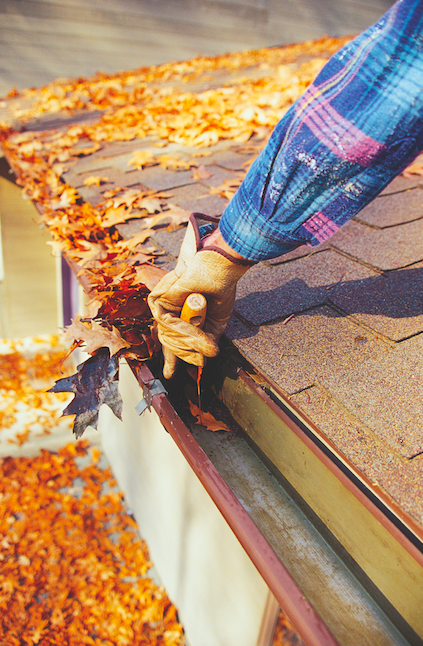 Gutters filled with leaves and other debris can quickly become heavy. This stresses the entire gutter system and can cause the gutters to fall off of the home entirely. · Nesting areas: Clogged gutters can serve as nesting areas for insects and birds. Mosquitoes and other insects lay eggs in pooling water. Gutters can quickly become breeding spots for harmful pests. Furthermore, birds may nest in gutters, creating unsightly messes and more damage. Seeds that sprout in clogged gutters can grow unchecked. · Ice-damming: Left untreated, pooled water and leaves in gutters can freeze over. Blocked water can back up and push against the roof, lifting shingles and destroying the roof in the process. · Foundation trouble: Clogged gutters also may contribute to flooded basements and cracked foundations. Leaking water will pool around the foundation, expanding when frozen and causing cracks in basement and crawlspace walls. It also can cause driveways and other cement areas around the home to sag and crack. Gutter cleaning should be scheduled in the spring and fall of each year. Homeowners can hire gutter-cleaning services to handle the job or do the job themselves. Rinse the gutters with water from the hose afterward to ensure good run-off. Take the time to seal any leaks as well. This routine maintenance can save homeowners many headaches and prevent some very expensive repairs.